"When art is free so are we." We're making a batch of "single-serving" sized Little Free Art Galleries, using a variety of found containers that are being up-cycled, altered, decorated, and each one outfitted with a single work of original art -- to be given away for FREE at an art show opening March 1, in Oakland, California. Stay tuned for location and other details. A large number of artists are expected to give away free original art at this show. Recognizing that most people rarely if ever engage directly with living artists and new, original works of art due to economic and class barriers and other factors, and seeing how we often fail to realize our own artistic abilities for similar reasons, the Little Free Art Gallery Project seeks to deepen our understanding of art and how to use it to enhance our lives through the practice of making art and giving it away for free. In this interactive, social art project, we create, and encourage others to create, art galleries and their digital media counterparts in a variety of configurations and sizes, deployed across a spectrum of public and private locations. 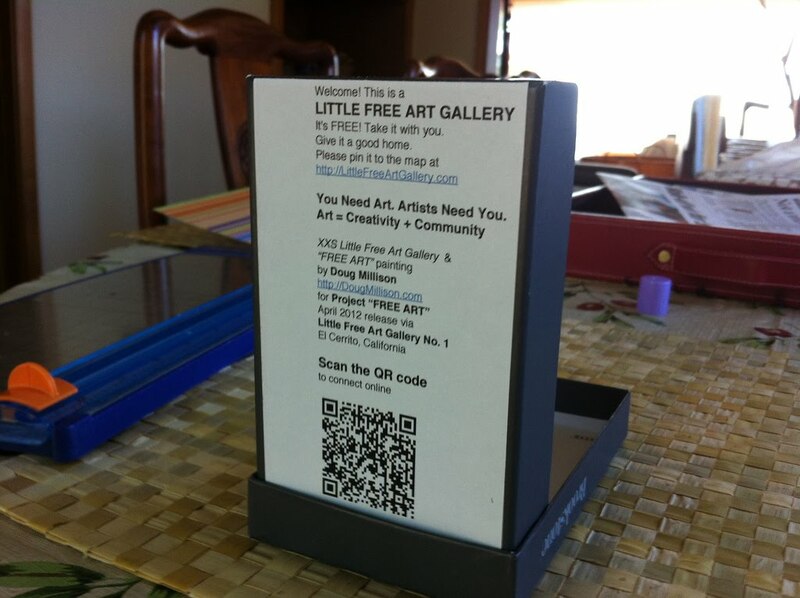 We invite and organize artists to use the Little Free Art Gallery installations to give away free, original works of art, and to document their gifts in the project's online and printed publications. We use this free art exchange to create communities and online networks where we engage each other and deepen our understanding of the world as we inspire and help each other to make and share art. Together in person, in digital media, and in print, we discuss art, its "value" and uses, our relationship with original art works and their creators, and related topics. By making and sharing free art, we seek to liberate our thinking and open more fully to the world and to each other. "When art is free, so are we." The work of art may thus consist of a formal arrangement that generates relationships between people, or be born of a social process; I have described this phenomenon as 'relational aesthetics,' whose main feature is to consider interhuman exchange as an aesthetic object in and of itself.